For this semester’s Barque Team get-together, I thought it might be fun to have “Brunch for Dinner”. The benefits would be twofold – a great way for my girls to sample a few of our food products (like buttermilk biscuit mix and local jams)… and second, I thought it would be easy to cook on a weeknight! 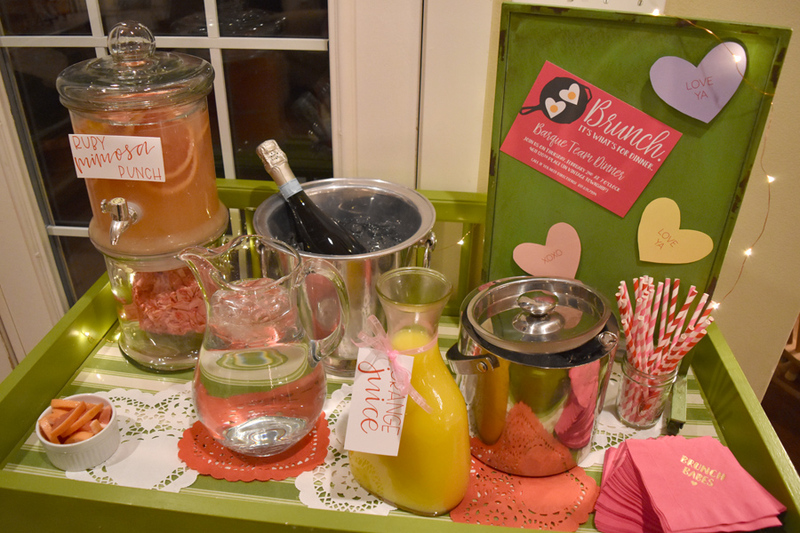 In this post, you’ll get a behind-the-scenes look at the invitation, party details, decorations, menu and party favors – plus an idea you can borrow to spark great conversation at your own Valentine’s Day gathering! Since I love Valentine’s Day, I thought that would be an easy theme to work with. I utilized my collection of vintage Valentines to add a little interest to my mantle. For the table, I used lots of layering – starting with a simple white tablecloth, then adding a length of sheer pink fabric (on clearance at Joann’s), followed by heart-shaped cut outs and doilies. To finish it off, more vintage valentines strewn about (some on tiny easels) and a sprinkling of conversation heart candies. For added ambiance, I combined a few tall white candles with strings of battery-operated, mini copper lights (a new arrival at the store). 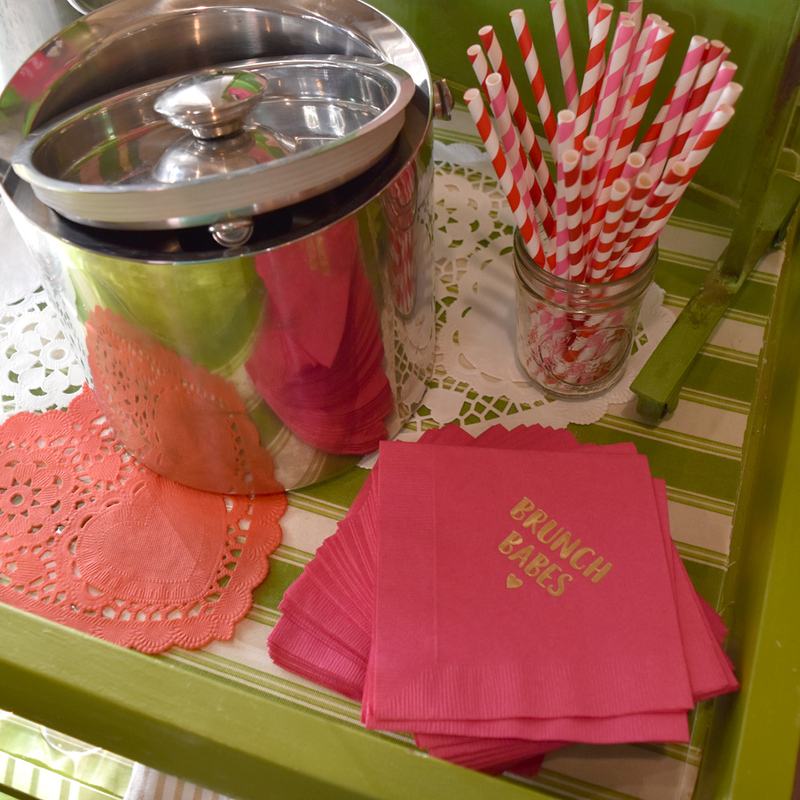 For each place setting, alternating pink and red napkins (folded in the shape of a heart) were adorned with a hand-lettered doily as a place card. The talented @kelseylaineholt (check her out on Instagram!) made them for us – as well as the food/drink labels – and they really made the tablescape swoon-worthy, don’t you think? Before guests got settled in, everyone was asked fill out 2 “Conversation Hearts”. This idea was inspired by Darcy Miller’s new book, Celebrate Everything – and it ended up being one of the favorite parts of the evening for all of us. HERE is a link to a free printable with the instructions, which can easily be displayed in a basic 4×6 frame. You can download the conversation heart templates HERE and HERE – just print them out on pastel colored cardstock and cut out by hand. We collected the completed hearts in a fish bowl, and they later became our dinner conversation starters! It was really fun to try to guess who each heart belonged to – and it sparked great conversation! 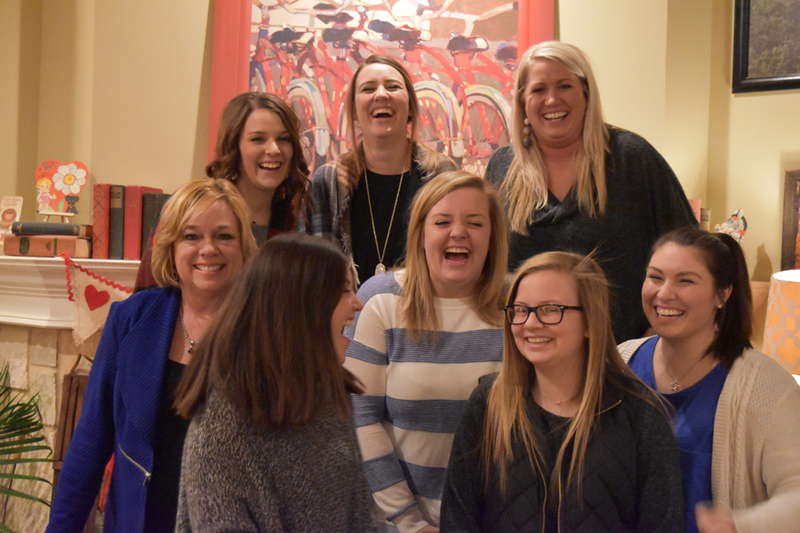 We learned a lot about one another (and laughed a lot too). The menu consisted of traditional breakfast food – eggs (heart-shaped of course), bacon, sausage, turkey bacon, buttermilk biscuits (see our tips for those here), local jams from Kelle B, fruit, yogurt (with heart sprinkles), and a modified version of Bobby Flay’s Rosemary and Pancetta Home Fries (from the cookbook Brunch at Bobby’s). To be honest, I’ve made this recipe before and it was delicious, but I must have done something wrong this time – oops! It didn’t work out as I had planned, so it became mashed the potatoes with rosemary and pancetta mixed in – sometimes you have to improvise! We tested out a recipe from the Forest Feast Gatherings Cookbook for the bar – Ruby Mimosa Punch – and it was quite tasty! I think a party always needs a favor, and for this one, each of the girls received a ball cap (monogrammed with the Barque logo), a box of conversation hearts, a mini jar of Kelle B Jam, and a Butter London nail polish. I love how the personalized tags turned out too! 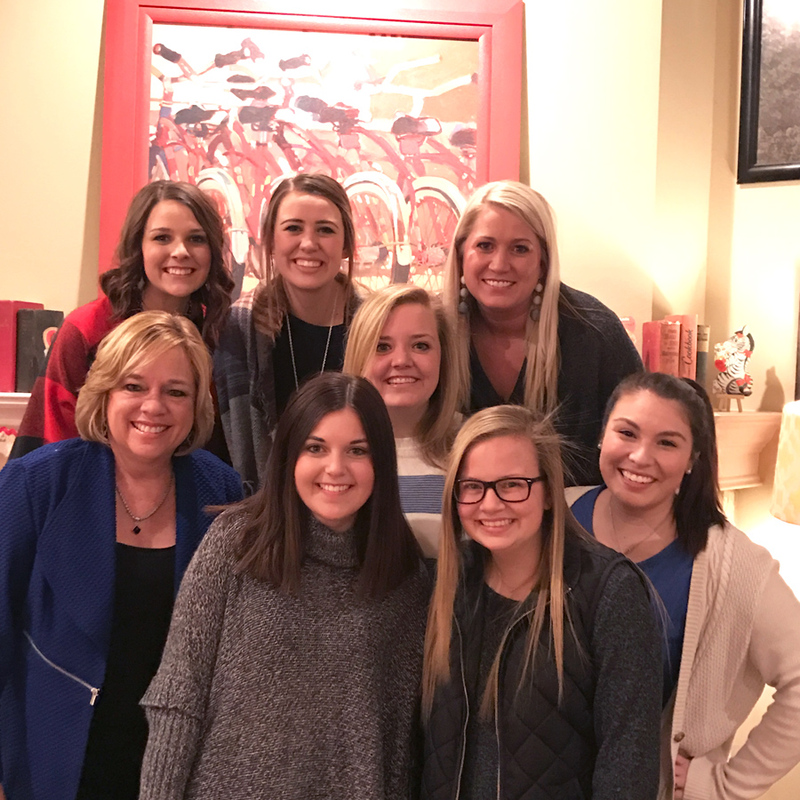 Corny or not, the tags are true – I really do love these girls! They’re a great bunch, and I’m so blessed to have each one of them working with me. The best part is I think they genuinely enjoy one other too – It’s not often you can work and play together and enjoy so much laughter. 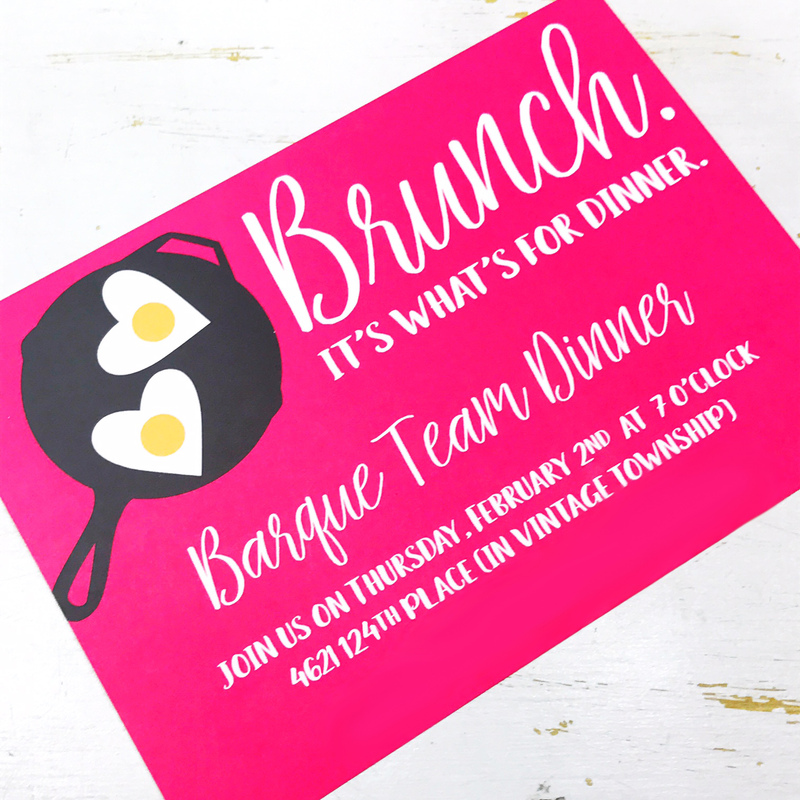 I hope our Team “Dinner” inspires a few ideas for your own Valentine’s (or Galentine’s) Brunch, and if it does, we’d love to know about it! Tag us on Instagram (@barquegifts) or email us photos – we love to see how our friends and customers throw a party!